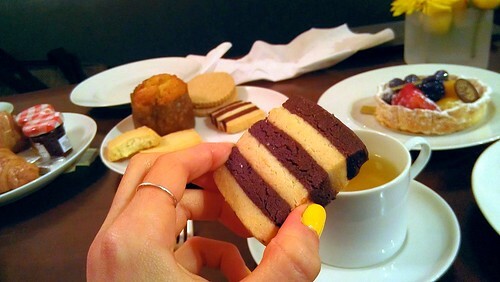 A few weeks ago, Petrossian, the bakery accompaniment to the fancy-pants restaurant of the same name (they're mega-famous for their caviar), invited me for a delicous tea party where they were debuting their new line of baked goods. On the roster? A creative new slew of cookies, including rosemary and fennel-parmesan shortbread, and lemon-thyme muffins. Sounded fun, but alas--I was attending the Pillsbury Bake-Off. Kind of a cool reason to not be able to attend, don't you think? By the way, did I tell you I met the Dough Boy there? But I digress. Regarding Petrossian, here's the really awesome part: we rescheduled, and I got a private tasting of basically every delicious thing there, along with their awesome public relations agent, Cynthia. 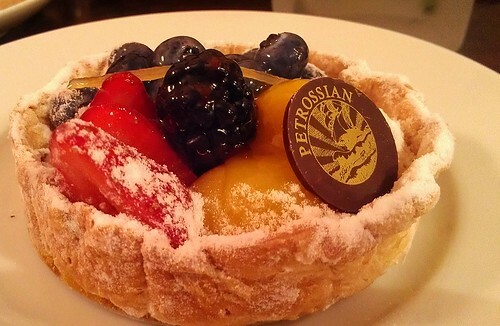 I was very excited because Petrossian is located in a building I love in New York City: Alwyn Court. It's really more like a sculpture than a building. I'd like to live there, please. 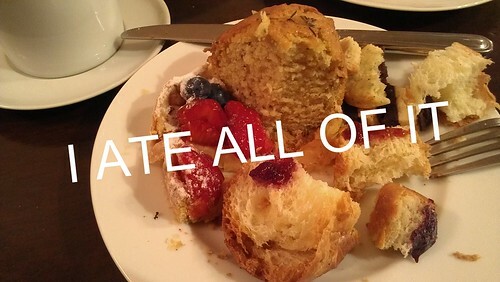 But lacking a few spare million dollars, I'm content to eat pastries nearby. 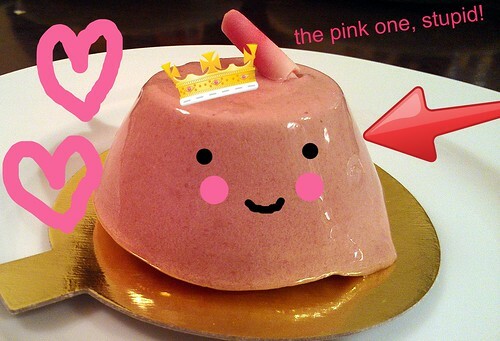 Are you ready to talk pastry yet? 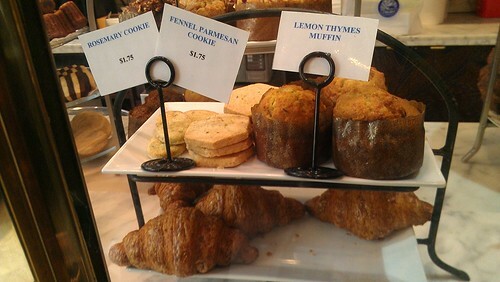 First, there were (of course) the new items: the sweet-meets-savory shortbreads and the new muffin. And their new line of jams. Not being a "muffin person", I would nonetheless file the lemon-thyme muffin under "very pleasant", very bright and lemony and with a perfect thyme kick to temper the zestiness. Overall, more poundcake than muffinlike, and with a sticky coating of something that made it even tastier. The new jams were also quite pleasant. They're made specifically for Petrossian, in Florida. They included seasonal flavors by a jam-maker who keeps her recipes and methods super-secret, but apparently they are done in "the French way". Well, the French secretive way is fine with me as long as it continues to involve chocolate. Raspberry chocolate jam? Yes please. 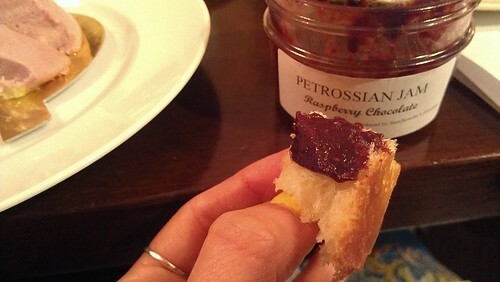 But (here, I will say it), even better than the jam was the delicious Petrossian brioche which they brought for us to sample the sweet stuff on. This brioche was light and fluffy and extremely delicious. 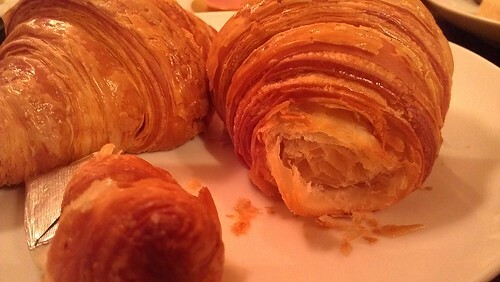 The croissants. Have I ever graced my mouth with a more beautiful croissant than this? These perfect pastry crescents shatter in the mouth, not the hand. The secret? 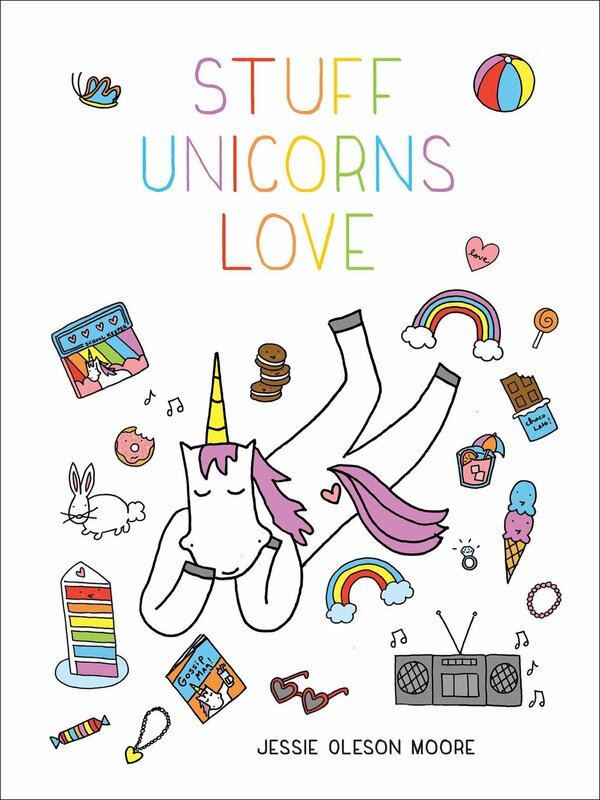 Butter and love. Apparently, the pastry chef, Antoine, has been doing the pastries (and doing them right) since day one. I wished I had a chance to meet him--but it was a pretty busy day. Next time. But the tasting didn't stop there. It was time to move on to the everyday shortbread: plain, pecan, checkerboard, and a few other variations. The Petrossian shortbread is a thing of beauty, perfect when paired with tea: lightly crumbly but very buttery, inviting you to take another bite. And another. And another. Cynthia insisted that we try one of their fruit tarts. The pastry, she said, was unlike anything else. Well, ok. Now, I will confess, I was slightly dubious. 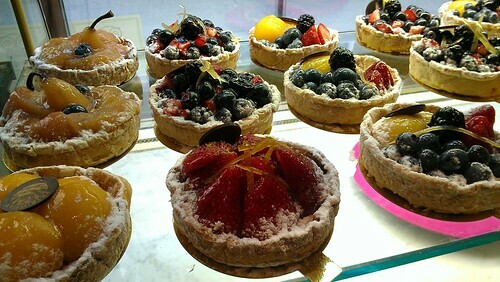 Those fruit tarts always look better than they taste, in my opinion. But you know what? This thing was good. Now, the fruit was good...but it was really just along for the ride with this buttery pastry crust. Like, OMG! How did they force feed a tart crust like 12 sticks of butter? At least, that's how it tasted. Of course, I simply had to try one of their fancy pastries, too. Which one do you think I wanted to try? 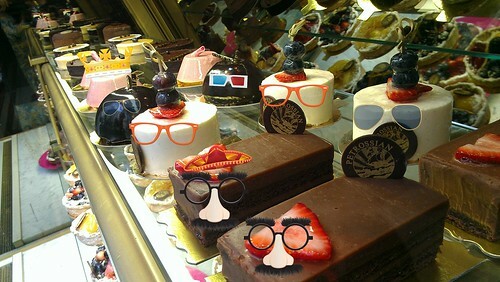 And P.S., how did I not know I could add glasses to pastries on flickr? Well, here's the one I chose. It was some sort of fruit-and-cream cheese puree, according to our waiter--it sat atop a little shortbread crust. He didn't know for sure what it was called. Well, whatever the name, it was delicious. I want another right now. 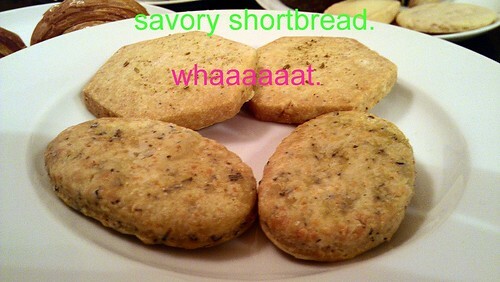 Finally, we got to the savory cookies. We also met with Helena, who is part of the family that owns Petrossian, and who manages various aspects of product development and the cafe. She told us that the cookies were designed as a way to get a satisfying morsel in a small bite. And what a fantastic solution. They're extremely satisfying. The rosemary one was the standout for sure, fragrant and buttery. The fennel-parmesan was good, but not as compelling as the rosemary. With both, the cookies straddled the line between sweet and savory: they seemed as nice with tea as they would with, say, a bowl of soup. Very interesting. Worth a try. Worth two or seven tries, actually. My overall summary? Go to Petrossian. Please. You get a taste of this storied company, and the pastries are not as pricey as getting their famous caviar. Try the new stuff, yes, but DEFINITELY be sure to stock up on the foundation items: croissants, brioche, and shortbread. And be sure to pick me up one of those pink things again. Petrossian Cafe and Bakery, 911 Seventh Ave (between 57th and 58th St.) New York, NY; online here.